Design professionals want to know how they can improve client outcomes while maximizing design excellence, according to 2017 research, and the solution is to use Lean practices with the owner and contractor during design. The Lean in the Design Phase eLearning course lays out the steps needed to achieve higher project satisfaction. 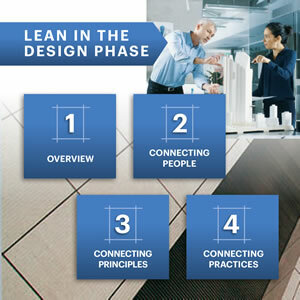 Is the Lean in the Design Phase eLearning course for you? Architects and engineers will learn to see the eight wastes in design that can be eliminated to drive innovation and increase engagement. Contractors, trade partners and all project team members will gain insight into how Lean in design optimizes collaboration and results for the entire team. Set targets. See real examples of Target Value Delivery and the set-based design process to steer teams toward on-time, on-budget delivery. Build the team. Understand how running an effective Big Room means more than co-locating people – it means aligning behaviors and building trust. Learn as a team. Learn how implementing the Last Planner® System for design purposes increases communication, reliability and gives a voice to all. Support the team. Explore how the Team Success Formula outlined in the modules will lead teams to achieve the high performance level needed to deliver design excellence. After completing the 90-minute eLearning course, download resources to begin using daily with teams to improve the Big Room approach and decision-making skills in the design phase. Companies and individuals like you will benefit from learning these Lean methods on your own time without taking valuable time away from project work. Are you an LCI member? LCI corporate members buying eLearning in bulk can efficiently train hundreds of employees and save up 75% with volume discounts by emailing eLearningdiscounts@leanconstruction.org. Special pricing is available for LCI members not buying in bulk in addition to non-member pricing. Looking for continuous education credits? Score 80% or higher on each knowledge check and the final assessment to receive a certificate of completion and a badge that can be added to an email signature showing that you are on a continuous path of Lean education. Those collecting AIA and AGC CM-Lean continuing education units can self-report 1.5 CEU for completion. Create a MyLCI profile if you have not already to receive LCI Immersive Education Program updates about new resources like the new Mindset of an Effective Big Room eLearning course to be released later this year!